Margo: So it’s the end of the beginning for the member for Indi Cathy McGowan. Wayne Jansson has kindly transcribed her answers to reporters’ questions at yesterday’s victory press conference. McGowan announced that she would end the hurt created by Ms Mirabella’s boycott of the Stolen Generations apology by making a formal apology on behalf of Indi next Sorry Day. Wayne discovered the journalist within while covering the Indi campaign for No Fibs and I reckon he’ll keep reporting for us. Fingers crossed. Q Why do you think you’ve taken the seat from Sophie Mirabella now, after people have been saying they’ve been disgruntled for many years? A – Three things happened, there was disillusionment and disengagement at the national level. There was a mood for change in Indi. The second thing through Voice for Indi we went out and talked to people, met with them and said this was important, asked them what are your issues and how we can run a campaign. And then we listened, we did what people said, there’s a very important message about that. The third thing is we offered a vision, a way ahead. It wasn’t just about negativity and stopping things. It was about what can the future of Indi be like, how could the community build the future. Through Voice for Indi we’re going to work on that agenda. Very early next year we’ll have the Indi summit, we’ll bring the community together to think about what’s the long term strategic view for us. How as a community we can make this community reach its potential. So we know we can deliver on that. We’ve got an enormous body of goodwill and skill now so we know we can deliver on that. Q – Will that summit lead into what you’ll take into parliament? A – In the short term yes. But in the long term at the next election, which I believe will be 2016, which I believe will be hotly contested, it will mean the community of Indi will have its own positions it can take to the election. We haven’t had time to do that for this campaign, but we need to do it for the longterm. We need to be able to go back to our political parties, to the government and say here’s what Indi wants. So the community owns the voice, and the community can ask of its government and representatives to work with us. The intent is to locate the power within the community, which I think is what democracy is all about. We want to claim that and then come up with our vision for how we want things to work. Q – What kind of impact do you think you can make in this new parliament? A – I want to be a little bit humble about this, and then I’m going to say enormous. It won’t be in the traditional way, because its not been a traditional campaign. The impacts I will have will be about relationships, as an independent I can work across traditional party divides and I intend to. I have got really good relationships, as all of you know, with the National party. I have really good relationships with the Liberal party, I have excellent relationships with the Labor party. I even think some Greens voted for me. I can bring that together. I will clearly be having a vision for Indi. I won’t be competing with the rest of the world to deliver that. I’m very confident with the backing of local government in Indi, with stakeholder groups, we’ll be able to get together and do the things that we know are important. Which won’t be about party politics, they’ll be about health, how can we get a plan that is going to work for us. How can we do community transport that actually works. There will be room for argument and logic in a well presented case. Because parliament won’t be so tightly held, I won’t be a king maker, there will be time and place for us to come up with strategic ways of doing things. The rest of Australia is going to look upon Indi and say, that’s a good idea, we could try that. I think in the long term that’s the impact we will have. The second thing is working with the community to have this vision, I think many other communities will then try and do the same thing. I’m sure there will be commonalities we can work on together. This election has created such national interest, people will be watching to see how we work, value driven. I’ve invited all my community friends to come and visit me in Parliament House, so its not just me, they’ll all have impact as well. Q – Who are you going to be seeking meetings with first, in terms of parliamentarians from either side of the political spectrum? Who do you want to talk to and why? A – I haven’t sorted that one out yet. The first people I know I need to go and talk with are the administrative services people about getting the office organised, a car and staff. The speaker; I need to get a seat on the back bench. Those are the practical things I need to do first. Parliament won’t sit until early November and they’ll have a training school for new politicians before then. I’ll need to go slowly, it’ll be new for me and many people. I won’t go barging in, I’ll be setting up relationships, I want to be there for the long term. I want to do the best for Indi. I’ll be putting in place solid foundations. I’ve had phone calls from each of the major parties who’ve said welcome, come and have drinks with us. I said that’s lovely. I’m really pleased to say the press gallery has been warm and they’re looking forward to welcoming me as well. I think I’ll be welcomed in and have a chance to work out where I fit. 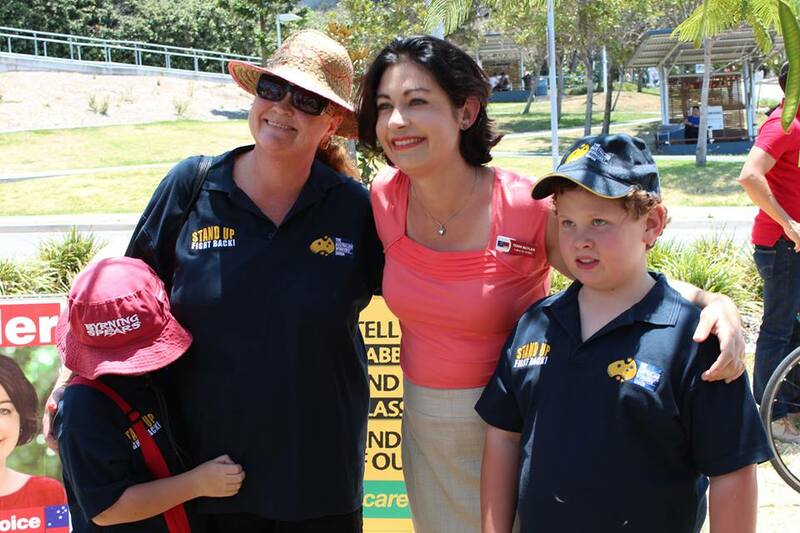 Q – There were concerns raised by the Liberal candidate that you might not have any leeway with the coalition seeing as you’ve taken the seat from them. What is your response to that? Do you think Tony Abbott will be willing to give the electorate the attention you say it deserves? A – The work of a member of parliament is three-fold. Its not all about working with Mr Abbott. One part of the job is setting up an office and being a really good local member. It’s got nothing to do with who’s in government, that’s about my skill. The second part is being an advocate for your community. Once the budgets pass the money exists in government departments. Its not about being a friend or otherwise of the government, its about making a case for your electorate. I’m very confident that I’ll be able to get our fair share of the money distributed to departments, for Indi, by making a good case and argument. The third part of the job is voting in parliament. In the last parliament that was hotly contested, Anna Bourke gives the statistic over 600 pieces were passed and 87% was bi-partisan. Most of the work is done outside the actual siting of the house, its done on committees and its done with relationships. I am really confident that I’ll be able to get the ideas and amendments in before legislation goes to the house. Hopefully I’ll then be able to vote for it because I’ve had a chance to input. That won’t be about Mr Abbott, that will be about really good solid policy and doing the research that I know I can do, deliver for rural and regional Australia. Q – What are the most pressing issues that you’ll be seeking to resolve? A – The first one is the trains. I can’t solve the train problem because its bigger than us. But meeting the relevant state members of parliament, and having meetings with the track authority to see what we can do. The next thing is letting the community know what the time line is, so they can follow it. Hopefully within two years it will be sorted out. It’s a problem I’ll be drawing great attention to. The second one is NBN and broadband. I’m not going to be the only one on that one. Mr Turnbull is being lobbied by everybody on that. I’ll be very happy to add my voice. Health is really important. I’ve been talking to the providers about getting an Indi consortium together so we can start talking about health. Within that, mental health is a really high priority. I’ve been talking to the Aboriginal people of Indi and have made a commitment to do four things, none will happen in a hurry but I’ve made the commitment. 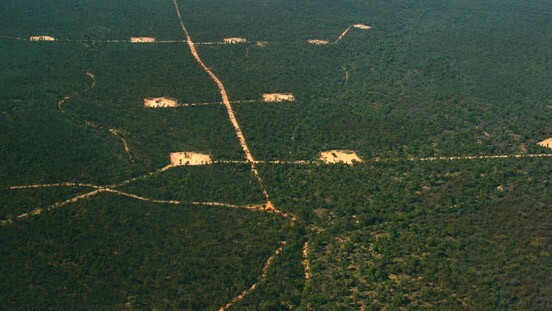 I will form an Aboriginal reference group to advise me on relevant issues. I will acknowledge country. I will do something about an apology to the Stolen Generations. We need to talk about that, we need to negotiate how that will happen, but we’re thinking Sorry Day next year might be an appropriate time to do it. The forth thing they’ve asked me to do specifically is about Aboriginal mental health. Which I’m very happy to do. Its a commitment to the Aboriginal people of Indi to involve them actively in politics, the politics that impact on them. That’s a very high priority for me. 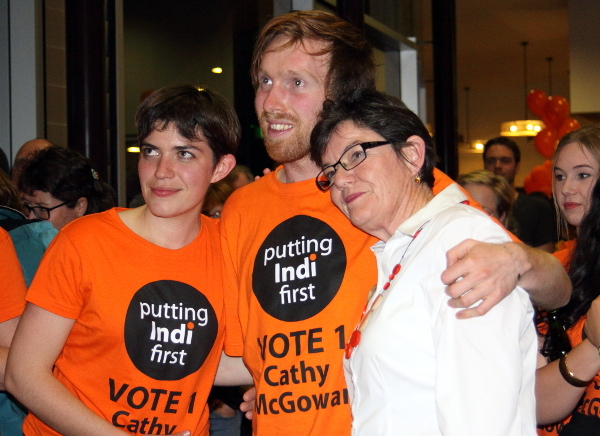 Congratulations to Cathy McGowan for the Indi seat. What an inspiration you have been to all of us. I hope many people around the nation now feel that as a community their concerns can now win out over existing political policies by putting a member of their choice to represent them in parliament. Well done. I wish i’d live in your electorate! no we don’t need to all move to Indi-we need to prepare to do the same in our own communities before next election! To everyone associated with assisting Cathy McGowan to become Indi’s MP; “Congratulations on a grass roots campaign very well done!” At long last we have an MP seeking to represent us instead of partisan political interests. Cathy gained our support on election day, now she deserves our full backing as she takes our causes to Canberra.